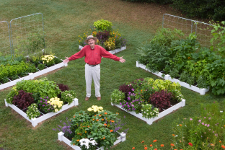 I recently received a comment from a reader who didn’t know what Square Foot Gardening (SFG) was at all. So, I decided to put together a “crash course” for any of you who are fuzzy on the details of SFG! That’s SFG in a nutshell, but there are plenty more details that make Square Foot Gardening the easiest and most efficient gardening method out there. Click each of these points to learn more. Thanks to Cassie Aula, one of our best certified instructors in Ohio, for the descriptions of the basics. No more gardening in rows! What a waste of space! Always think in squares: lay out 4 foot by 4 foot planting areas with 3′ wide aisles for easy walkways between them. 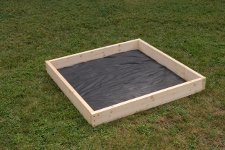 Build garden box frames no wider than 4 feet x any length, and 6 to 8 inches deep. Boxes can be built from wood, vinyl or even cinder blocks. 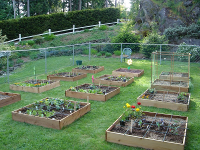 If you plan to have more than one garden box, separate them 3 feet to form walkways. Aisles can be made from grass, brick, stone, mulch or any other material that enhances your garden plan. Don’t dig up or use your native soils! 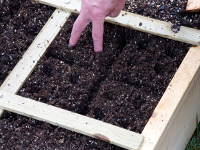 Line the bottom of your box with a good weed fabric and fill boxes with Mel’s special soil mix: 1/3 blended compost, 1/3 peat moss, and 1/3 coarse vermiculite. 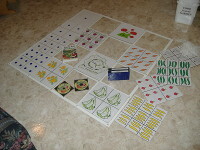 On top of each frame place a permanent grid that divides the box into one foot squares. The grid is the unique feature that makes the whole system work so well. Since you will NEVER walk on or depress the growing soil, don’t make the frames any wider than 4 feet (2 feet, if only one side is accessible). Any wider makes it too difficult to reach in to tend the plants. Tend to plants regularly and trim dead leaves and branches with a pair of scissors. Harvest with scissors, too, to protect the plant from damage. 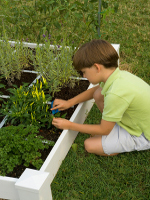 Depending on the mature size of the plant, grow 1, 4, 9, or 16 equally spaced plants per square foot. 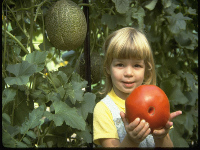 Choose fruits and veggies that make sense for your family and for the intensive planting style of the Square Foot Garden. 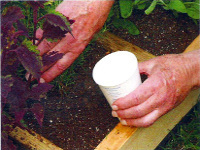 Plant two or three seeds in each spot by making a shallow hole with your finger. 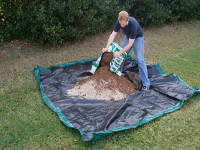 Cover, but do not pack the soil. After sprouting, save the best one and snip off the others – thinning is eliminated. Seeds are not wasted. Extra seeds can be stored cool and dry in your refrigerator. Don’t over-plant. Plant only as much of any one crop as you will use. Water the root area only using a cup from a sun-warmed bucket of water. Water often, especially at first, and on very hot dry days. Warm water helps the soil warm up in early and late season. Harvest continually and when a crop in one square is gone, add a handful of homemade compost and plant a new different crop in that square. That’s how simple the whole system is! Remember, you don’t need any tools or fertilizer. Once your garden is built, there’s no work…and best of all, no weeds! 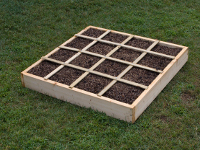 If you’re just getting started with Square Foot Gardening, leave a comment below and let me know if this crash course helped you understand the method better!